The following instructions can be used to whitelist Ubiety as a federated partner for your Lync environment. 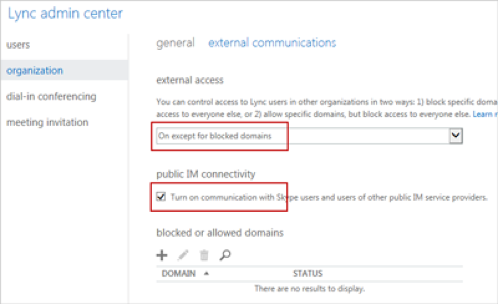 This is required to enable connection from Lync clients to the Ubiety platform. 1: Pre-requisite:Please ensure the Lync topology has federation enabled.See the following Microsoft guide on setting up Lync federation on the Lync edge server. a: GoDaddy Class 2 Certification Authority Root Certificate – Trusted Root Certification Authority context. b: GoDaddy Secure Server Certificate (Intermediate Certificate) – Intermediate Certification Authority context. c: Alternatively, you can use the certificate chain GoDaddy Certificate Bundles - G2 With Cross to G1, includes Root to import all the certificates. 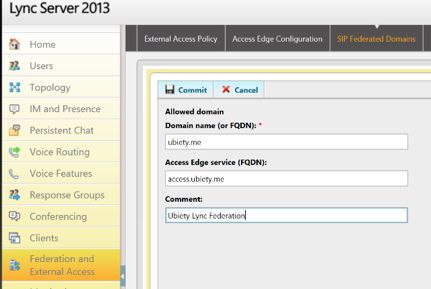 4: Lync Federation:Enable (whitelist) the Ubiety domain using the settings in the graphic below. 1: Go to the Office 365 admin center > Skype for Business > Organization > External communications. 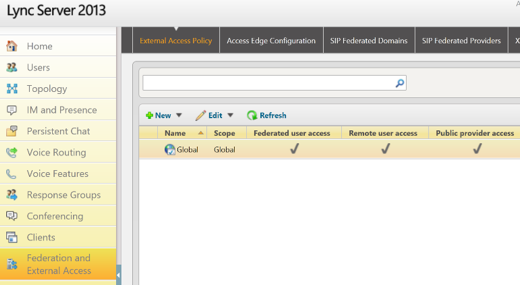 2: Set the desired option for federation – only allow specific domains (see here for more options). 3: Add the domain ubiety.me and allow access. This guide assumes that all outbound IP has been allowed from the Lync environment to the internet for call setup and media traversal to enable calls both to and from Ubiety to your Lync environment. If there are specific outbound restrictions, the rules will need to be treated as bi-directional. For Lync 2010 and Lync 2013 calls, the following firewall configuration is required in your environment. 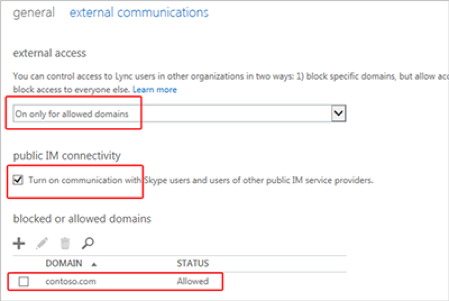 Please refer to the Lync federation instructions if you are using domain whitelisting to allow federation to your environment.